1) Preliminary research, plus a reading of a book adaptation of the story. 2) Watching and reviewing the popular Hollywood representation, Don Bluth’s The Swan Princess. 3) Watching and blogging about a recorded production of the actual ballet. I’m also going to see if I can post all three parts of this in the same week. Wish me luck on that part. Anyway, on to the background information! Swan Lake was a ballet composed by Pyotr Ilyich Tchaikovsky that first hit the stage in 1877. Despite being blasted by critics, the initial production had a long, healthy run. The ballet was revived with some alterations in 1895. The music was altered, as was the ending (more on that later). The origins of the story are a bit nebulous. It’s supposedly based on a story by German author Johann Karl August Musaus entitled “The Stolen Veil”. It also bears a strong resemblance to the Russian folk tale “The White Duck”. Tchaikovsky was also supposedly very interested in the life of Bavarian King Ludwig II whose life and misfortunes were frequently marked by the sign of a swan. Whatever it was, Russian ballet patriarch Fyodor Lopukhov considered Swan Lake to be Russia’s “national ballet” because he saw many of the symbols and elements of the story as being essentially Russian. Now, it’s the most well-known ballet around. It’s a 2002 picture book which gives Pyotr I. Tchaikovsky writing credit and illustration credit goes to Hans Christian Andersen award winner Lisbeth Zwerger. This is kind of a pleasant surprise because I haven’t had the chance to do anything about picture books on the blog yet. It’s a lovely book. All the illustrations seem to be painted in watercolor. (Please note: all these pictures belong to the copyright holder. I’m simply posting them for illustrative/educational purposes). The Cliffs Notes story is as such: It starts with a prince being told by his mother that he has to get married. She says that she’ll hold a ball and invite many princesses. At this, the prince decides to live in the moment and go hunting with his buddies. He grabs his bow and chases after a flock of swans he saw. Getting tired, he stops to rest by a pond when in a flash of light, the most beautiful woman he’d ever seen appears. 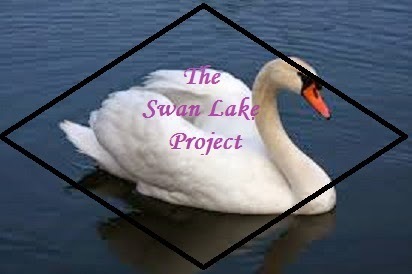 She explains that she was the swan he tried to kill and that she was put under an evil spell by a sorcerer. By day, she’s a swan and at night a woman. The only thing that can break the spell is true love. The prince invites her to the ball the next day, where (seeing as he’s quite smitten) he will introduce her as his bride. The next day is the day of the ball. The prince is waiting for his Swan Queen to arrive. Suddenly, he thinks he sees her, dressed in black and being led into the ballroom by a strange man. The prince swears his undying love for this woman when who should enter but the REAL Swan Queen. The Swan Queen, betrayed, leaves. The prince chases after her. She returns to the lake and her swan sisters. Then the Swan Queen starts being pulled into the water by the sorcerer’s power. The prince rushes to the rescue and saves his Swan Queen. Insert “happily ever after” here. (Phew. You know, I’m not sure it’s a great idea to summarize a whole book/ballet in two paragraphs). Anyway, like I said, it’s a lovely book and a nice story. The story is filled with all sorts of fairy tale motifs, particularly in regards to transformation. There are echoes of the “animal bridegroom” motif, with the swans assuming human form at night. Also, I’m reminded of other stories where women take on animal forms like the Irish selkies (seal women) and even a Chinese story entitled “The Peacock Maiden”. There are some bits in the book’s illustrations that really caught my attention. For example, how the Swan Queen’s hand and arm seem to be made up to look like the head and neck of a swan. I don’t know if that’s some sort of traditional costuming from the ballet, but I still think it’s neat. Now, we need to talk about the ending. Most versions of the Swan Lake story have a tragic ending. According to Lisbeth Zwerger, Tchaikovsky originally wanted a happy ending for the 1877 version of the ballet. The ending was supposedly changed for the 1895 version. However, other sources I’ve read claim that the original ending has the two leads drowning at the hands of the sorcerer while the newer ending has the Swan Queen committing suicide and the prince choosing to die to be with her. So, if that’s the case, then neither ending was particularly happy. So, that’s part one. Stay tuned for a look at the Hollywood animated version of the story next time.